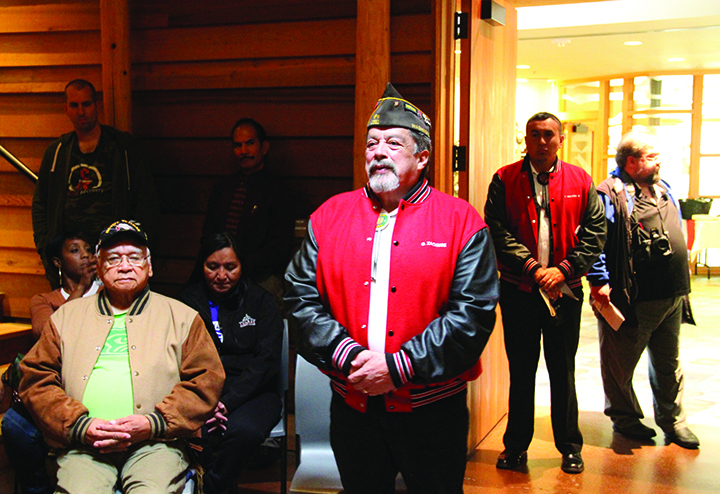 Tulalip community members gathered at the Hibulb Cultural Center on November 11, to honor our veterans. They paid tribute and gave thanks to the brave men and women of Tulalip and its surrounding communities, who served and are currently serving in the United States Military of Armed Forces. Several Tulalip tribal member quilters banned together and made quilts to present to, and recognize, a handful of the Veterans. 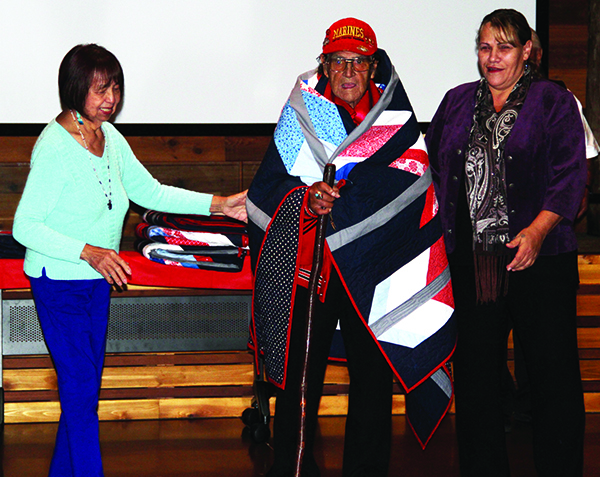 After many weeks of hard work, the group made a total of seven quilts to gift to the elders who fought for this nation. 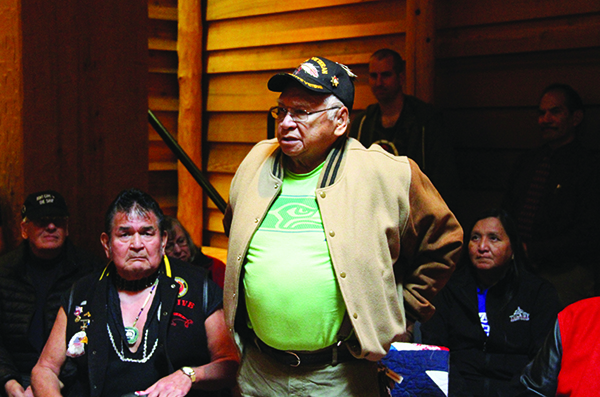 In the Hibulb longhouse, community members gathered and showed appreciation to those who protected the rights and freedom of Americans nationwide. During roll call, the community listened to the Vets as they shared stories and experiences from their time in the service. 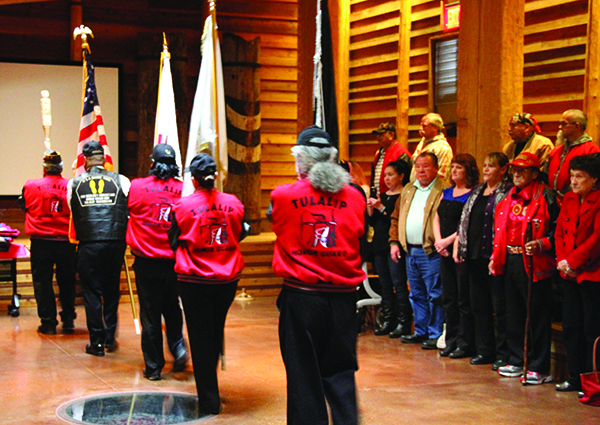 Once roll call came to a close, a moment of silence was taken in remembrance of the fallen soldiers who paid the ultimate sacrifice, as well as to pay tribute to Tulalip’s Golden Mothers. The Veterans Day event concluded with lunch, a carving demonstration by Tulalip Master Carver Mike Gobin (Navy Veteran), and a Veteran’s Healing Forum that was led by Reverend Bill Eagleheart Topash (Marine Veteran). 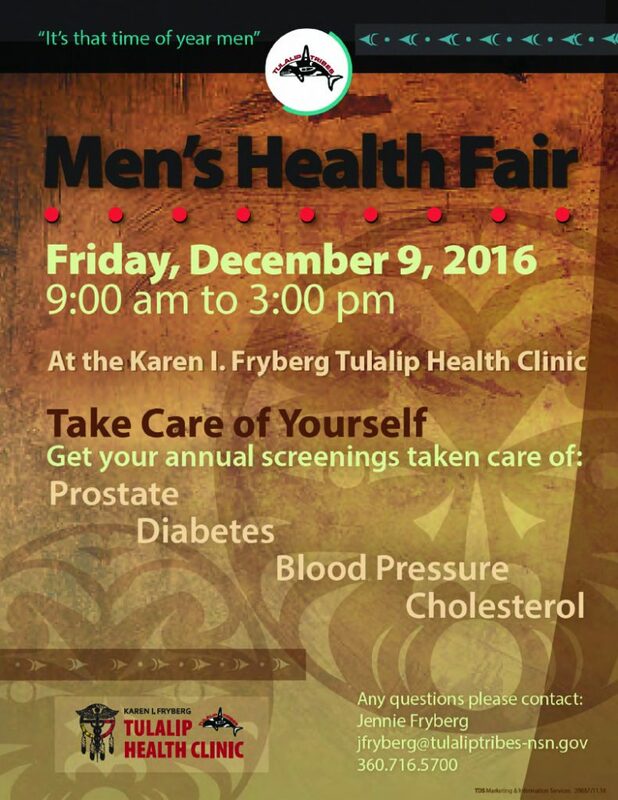 The Karen I. Fryberg Tulalip Health Clinic is reminding men to take charge of their health as the upcoming Men’s Health Fair is right around the corner. Scheduled to take place on Friday, December 9, from 9:00a.m. 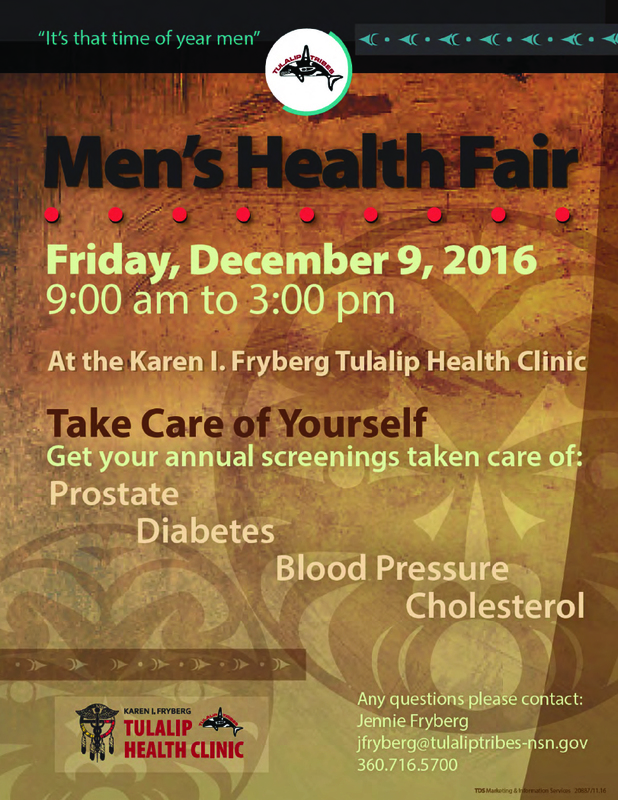 – 3:00p.m., the annual health fair is all about raising awareness for men’s health, with a particular focus on preventative measures. Some of the health prevention measures offered will be a cholesterol screening, blood pressure checks, prostate screening (via a blood draw), hearing and vision tests, diabetes screening, as well as many informational booths. Hypertension (high blood pressure) and high cholesterol are two of the most frequent diagnosis for Native men. Both can be easily screened for and detected with the simple prevention screenings offered that the health fair. If detection occurs, follow-up appointments can be schedule right on the spot. In recent years at the health fair, Jennie says there are typically three or four men who, based on their screening results, decide to schedule follow-up appointments. Along with all the preventative screenings and informational booths there will also be demonstrations by Haggen Northwest Fresh meat department and Klesick Farms. The demos will focus on healthy eating made simple, along with detailing the various health advantages of eating local and organic. For those who still require that extra incentive to attend the health fair and make their health a priority, let’s not forget about the raffle giveaway. All men who attend and participate in the screenings will be entered into a raffle that includes various prizes and goodies. Highlights raffle prizes include chainsaws, tools, and a stand-up freezer. As a reminder, you do not need to be in attendance at the raffle drawing to win. All winners will be contacted through phone and/or e-mail to collect their prizes. Dr. Stephanie Fryberg, keynote speaker for the first annual tribal training under the MOA. In January 2016, the Tulalip Tribes and the State of Washington signed a Memorandum of Agreement (MOA) that would allow the two entities to collaborate on government-to-government issues regarding child welfare and Tulalip youth. 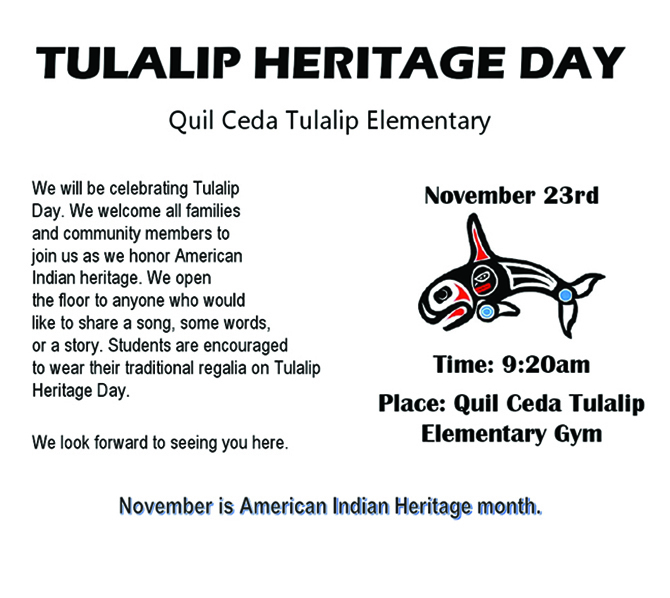 Tulalip wants to ensure that the youth of the community remain connected to their culture and their people. Previously, in the event that a Tulalip child was taken out their home, the child would enter the system and often would be placed in the home of non-natives. This practice caused a disconnect between the youth and their families and culture. Tulalip has long worked on a resolution, and at the beginning of 2016 the resolution was presented in the form of the MOA. The agreement involves the Tulalip Tribal Court, beda?chelh, and Child Protective Service caseworkers uniting together to ensure that when a Tulalip youth is removed from the their parent’s guardianship, that child will relocate but remain with family. If family is unable to take the child in, alternate families throughout the community are considered and are the next option for placement. Once the child is relocated, beda?chelh team members remain involved, often assisting the families with guidance and informing them when cultural and community events are occurring. Recently, in the month of November, caseworkers and team members of Washington State Children’s Administration traveled to the Tulalip Administration Building for the first annual Tribal Training Under the MOA. Tulalip’s goal for the first training was to make sure the trainees had a clear understanding of how a tribal community operates. The trainees had the opportunity to meet the teams they will be working with including, Judge Whitener and the Tulalip tribal attorneys, the beda?chelh team, as well as Tulalip Tribes General Manager Misty Napeahi and Kinship Coordinator Verna Hill. 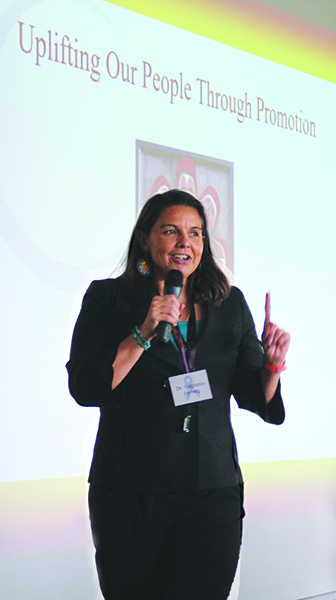 Dr. Stephanie Fryberg, keynote speaker, shared her experience growing up on the Tulalip Reservation. She explained that the modern society praises an independence lifestyle, which is introduced at a young age. Independence is based on the decisions an individual makes, meaning a person’s successes and failures are placed entirely on that individual. She then explained to the group the opposite of independence, interdependence. Dr. Fryberg explained that the majority of the world adapts the interdependence lifestyle. Interdependence is the reason why many cultures including, Native American, have strong, deeply connected communities. With interdependence, each individual has a role to play within their community. If a person fails they are supported by their community, allowing the individual the opportunity to learn why they failed. Not only does this present the opportunity for the individual to learn from the mistake but also the chance for more experienced members to pass down advice and knowledge to the individual, therefore making a stronger connection amongst community members. Dr. Fryberg spoke of the importance of growing up in an interdependence based community. She informed the group that she has taken in two Tulalip tribal children, the youngest an infant boy who was born prematurely.